If you ask an Australian what a saloon is, chances are you’ll get an answer along the lines of ‘a hairdresser shop’ or ‘a barber’s shop’. 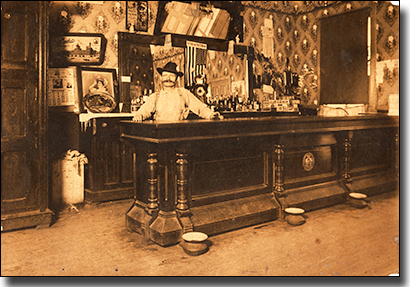 Few would recognise a saloon as a type of bar, particular to the American Old West. During the early 1800s, the first saloons were built in Wyoming and its surrounding states, and established to serve cowboys, soldiers, fur traders, prospectors, miners, and gamblers – recreational facilities for a largely male population to enjoy drinking, gambling and prostitution services. By the late 1800s, the development of saloons around the Western states of America had boomed, and according to an edition of ‘The Week: New York’, there were “about 150 saloons and four wholesale liquor houses” in Leavenworth, Kansas. As saloons became more and more popular, diverse types began to open, including saloons which served restaurant quality food and drink, gaming saloons for ten-pin bowling, darts and billiards, dance hall saloons and saloons with performing dancing girls (can-can girls), who would often work as prostitutes, too. Many venues would also feature pianists and theatrical shows and skits. Free lunches were regularly advertised in order to attract more customers and gamblers. The large majority of saloons would stay open 24 hours a day, and seven days a week, only closing on Christmas day. The American saloons of the 1800s (also known as gambling halls) produced some of the finest, most prominent and professional gamblers, but the saloon gambling scene was not immune to heavy criminal activity – the ‘get rick quick’ element of gambling appealing to many crooks who would attempt to scheme genuine punters and the house of their money. “I am no ordinary gambler,” he once said. Simple but highly entertaining games of a combination of chance and skill, it are these titles which have laid the foundations for many of the card games we enjoy today, and we can be thankful to the rise of Old West saloons for their influence on Western culture’s fascination with bars, drinking and gaming. 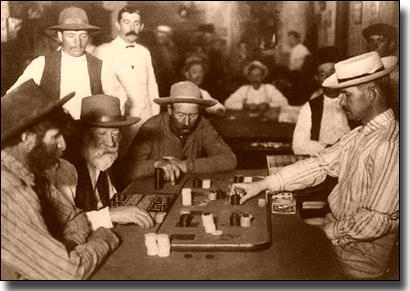 The era of Western gambling in saloons came to a close during the first half of the 20th century, when anti-saloon and women suffrage reform movements started to arise, along with the start of World War One which paved the way for a temporary ban on brewing. However, Nevada was one of the few states which bucked the trend, as gambling remained a constant and more venues were established. During the latter half of the 20th century, gambling made a swift comeback, and Las Vegas built, and continues to build, what is arguably the most devoted and impressive gambling city in the world. Today, the Cromwell Las Vegas boutique hotel and casino on the Las Vegas Strip (which was called Bill’s Gamblin’ Hall and Saloon back in 2007) pays tribute to the American Old West saloon era.